What do we mean by scarcity in general? Scarcity is the state of unavailability of certain goods in a society. In economics, Scarcity means limitations that imply inadequacy or insufficiency in goods, resources and capacities through which desired goals are achieved. It is considered to be a basic economic problem. It is a situation that makes people take responsibility and make wise decisions so that they can divide resources accordingly and make the best use of them in order to fulfil their basic needs. Rearing less cattle- Lower the number of cattle, higher the chances of scarcity. If cows, hens, goats are not sufficiently reared, there will be inadequacy in supply of eggs, milk, cheese etc. which are our basic every day needs. Fishing more than required- When the ponds and rivers are fished in excess, there might be scarcity in a particular type of fish or all types of fishes for that matter. Seasonal Scarcity- Seasonal scarcity takes place in cases where some fruits and vegetables are available only during a particular season. So, during the rest of the seasons those vegetables and fruits are scarce. Less rain- Rain as we all know has a colossal effect on nature. All the plants need water to grow and rain is the most effective source of water. Sometimes, too much rain is also harmful for the crops. The entire concept of Economics is based on one principle, The Law of Scarcity. The Law of Scarcity is based on the nature of the human beings. Humans are never satisfied with what they have, their wants are infinite. It is obvious that all the wants of human beings cannot be met because there are not enough resources available all the time. So, scarcity is the result of the never ending wants of people and insufficient availability of the resources and it is the reason behind creating Economic systems. If there were no trade systems and people could have whatever they wanted the resources would disappear soon and we all would die. So, for allotting limited resources to the people equally, a trading system takes place with currencies coming into the picture. Currency has become the most valuable thing in a society. When we have something that we do not want much, we trade them so that we can have things that we do not have but we need. What Are The Types Of Scarcity? Economic scarcity- Scarcity of resources depends upon its demand and supply. When the supply of a resource decreases, the price of that resource drives up making it economically possible to bring new supplies in the market. Physical Scarcity- Physical scarcity is something that is caused by the physical world example, water, oil, land etc. When we have a limited resource, scarcity depends on the demand and availability of the resource. Scarcity as quality of resources- This is a type of scarcity that does not have anything to do with demand, supply or economy. It is the non- market scarcity. This includes the supply of a certain quality of resource that is diminished. Example- loss of biodiversity, clean forests etc. Geopolitical Scarcity- Geopolitics is the relation between political processes and geopolitical settings. There are groups such as national or organisational can maintain or control the supply of some resources for achieving economic or political ends. 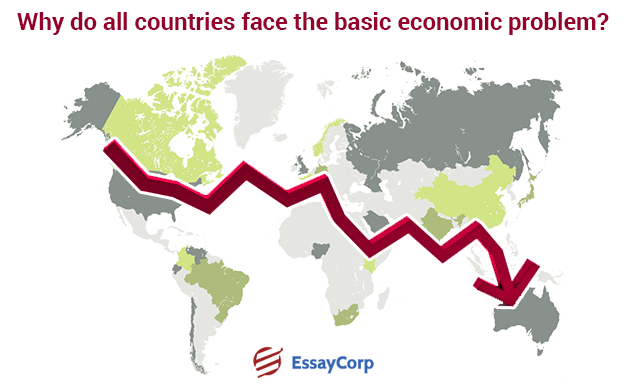 According to a study on the essential process of an economy, there are some fundamental problems that arise in every economy of all the countries regardless of its growth. There are two basic factors because of which we need an economy, the first is the human needs for resources are never ending and the second is availability of goods and resources are scarce. What to produce- This problem means what goods and services are to be produced and in what quantity should they be produced. Since every Economy has limitation of resources, they cannot produce everything. Increasing the production of one good lowers the chances of producing other goods. Goods are produced and their quantities are decided on the basis of their needs and importance. Labour intensive technique– in the Labour Intensive Technique, the labour is more used than the capital. Capital intensive technique– in the Capital intensive Technique, the capital is more utilized than the labour. For whom to produce- This problem concerns which people are going to receive the goods, it can be more for the rich and less for the poor or more for the poor and less for the rich. Distribution of goods depends on the paying capability of people. So, basically scarcity is that state in an economy where the resources are less and their demands are high. A situation where someone’s favourite food or favourite clothes come to an abrupt unavailability, that situation is known as scarcity. 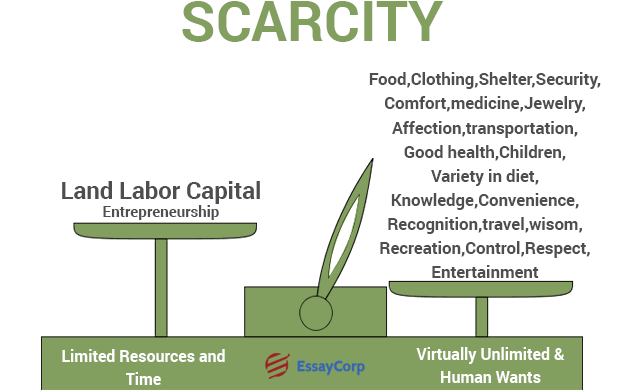 There are different causes and types of scarcity as discussed above. It happens to all the economies no matter how flourishing it is.